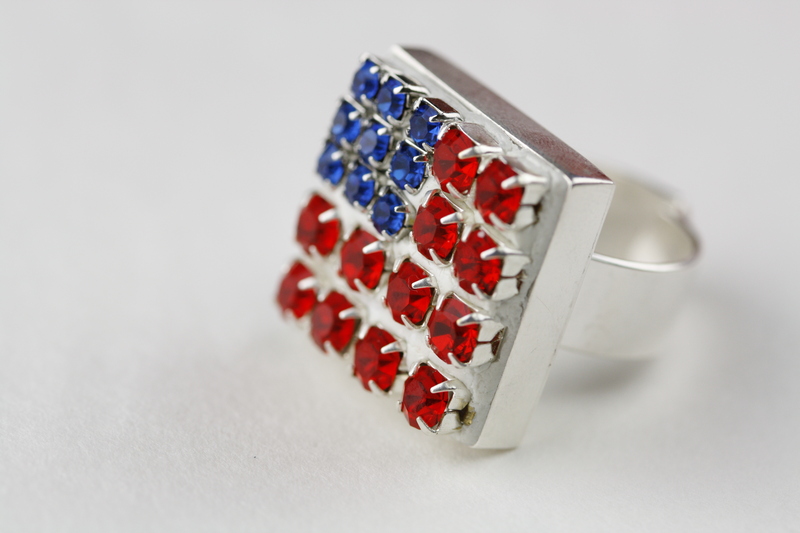 This fantastic and easy to make ring is a fun way to show off your Patriotic side, especially on Independence Day! 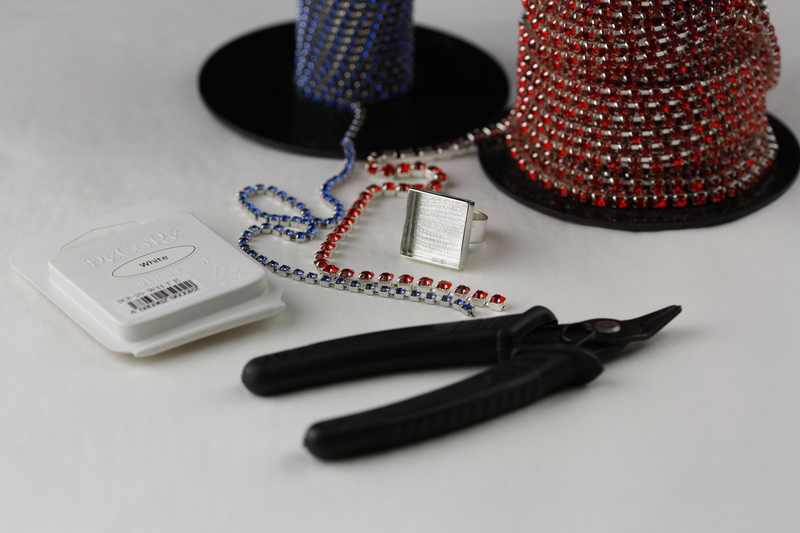 Take your 3mm Capri Blue Rhinestone Cup Chain and use the flush cutter pliers to cut the chain into three equal segments of three rhinestones each. 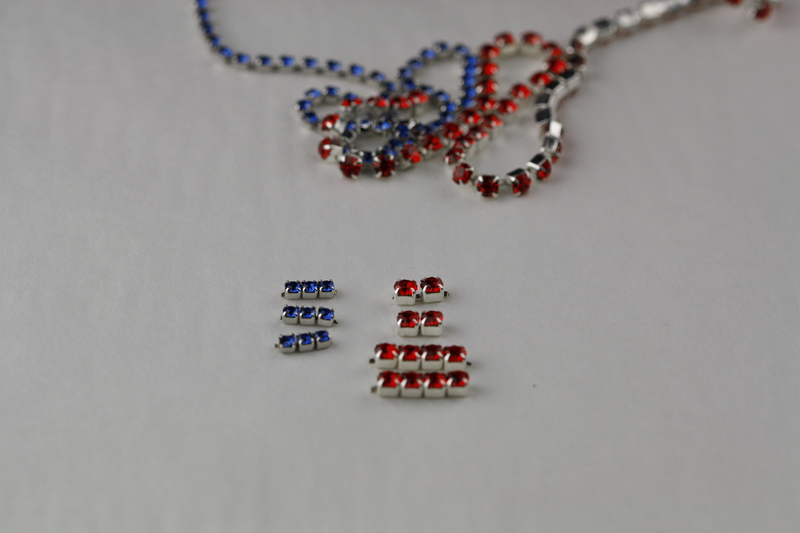 Take your 4mm Light Siam Rhinestone Cup Chain and cut it into two sections of four rhinestones each and an additional two sections of two rhinestones each. Check the fit of your chain segments by placing them in the ring before you prepare your crystal clay. There should be some extra room which will be filled by clay. Next, prepare your DeCoRe Crystal Clay by kneading an equal amount of A and B together (for a video that shows you how, click here. Your DeCoRe also comes with instructions). 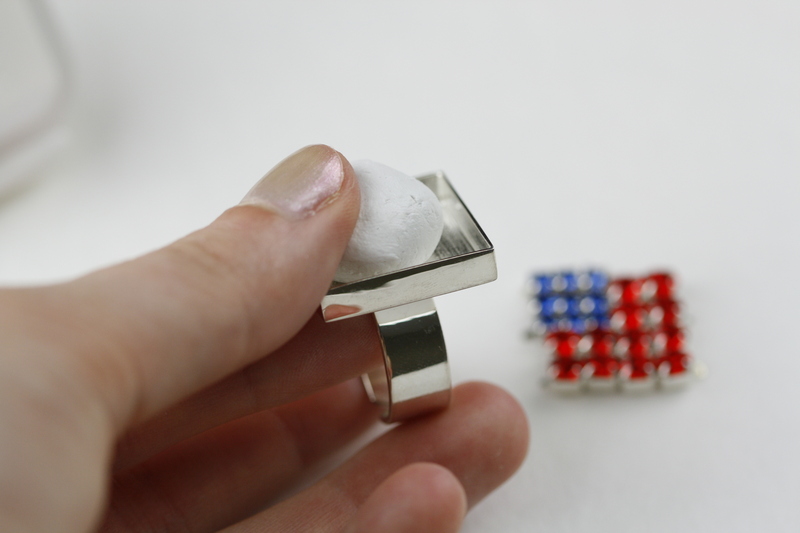 Press your crystal clay into the Square Bezel Ring and flatten, making sure to fill the bezel without overfilling. You want the level of clay to be flush with the bezel or just a little hollow. Remove excess clay before adding the rhinestones. Begin adding your segments of chain in the upper left corner and move downward. Lightly press the pieces as you are placing them so that they hold but can easily be rearranged. 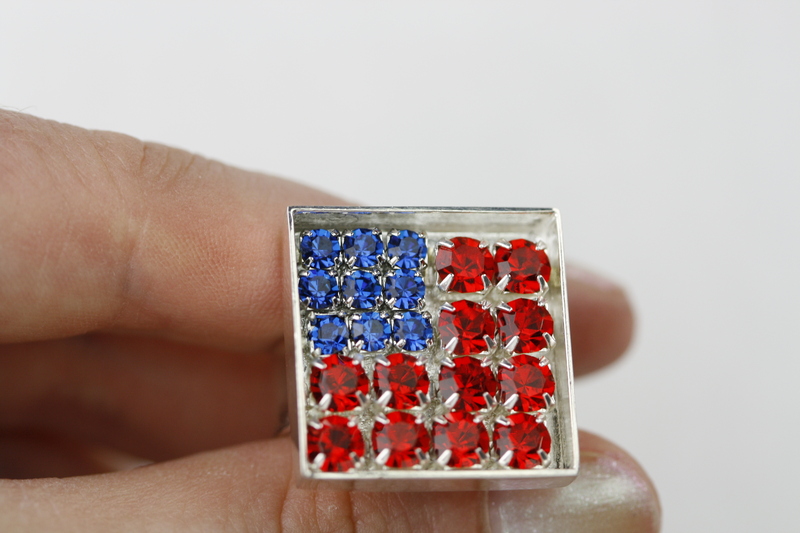 Once you are satisfied with the arrangement of the rhinestone chain, making sure to even out gaps and keep the rhinestones straight, gently press the rhinestone chain into the DeCoRe. 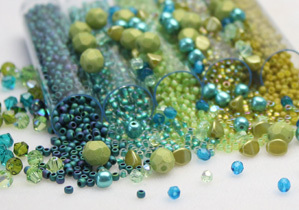 In order to make an even surface, you can gently press the ring rhinestones down on a sturdy cloth covered surface. When the ring is finished, make sure to wipe the bezel and rhinestones gently with a soft cloth to remove any clay residue that can make it dull. Your ring will be set and ready to wear in 24 hours! And voila! 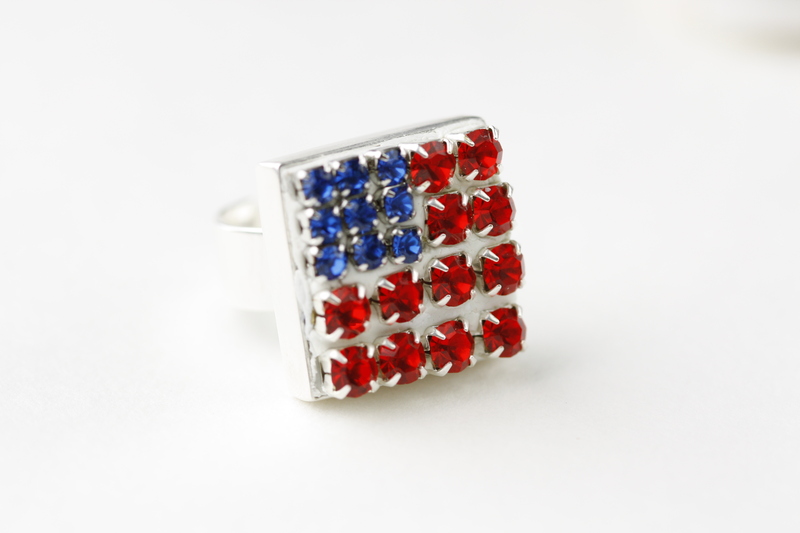 Your American Flag Ring is ready to be rocked! Wow so cool! 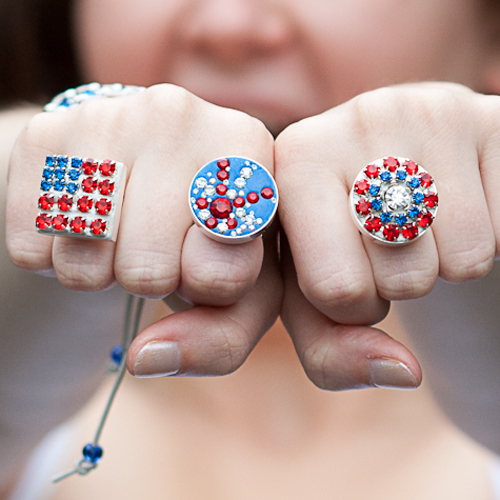 You look like Wonder Woman with those rings!